Muscles of the head and neck are for the most part highly specialized, and each exhibits unique functional properties. Extraocular muscles are innervated by lower motor neurons in cranial nerves III (oculomotor), IV (trochlear), and VI (abducens), which originate from the brain stem. They are among the fastest muscles in the body and are continually active during awake hours as well as during certain segments of the sleep cycle, called rapid eye movement (REM) sleep. As described below, the oculomotor system serves as a useful model of many of the generalized properties of motor pathways, including: (1) reciprocal excitatory and inhibitory innervation of synergistic muscle groups, (2) hierarchical organization of cortical centers, and (3) somatotopic organization of cortical motor areas. As detailed in Chapter 51, activity of lower motor neurons in the oculomotor, trochlear, and abducens nuclei is under the control of several groups of interneurons. Two groups found in the brain stem, the horizontal gaze center and the vertical gaze center, yoke the activity of left and right oculomotor nuclei so that they send coordinated signals to left and right eyes, allowing coordinated movement of the two eyes. Experimental stimulation of the left horizontal gaze center will elicit a highly stereotypic eye movement to the left in both eyes. The motor programs from both gaze centers also coordinate neuronal input to the six individual muscles that innervate a single eyeball, so that opposing or antagonistic muscles on either side of the eye do not try to contract at the same time. Mutual inhibition of antagonistic muscles is a standard feature of all peripheral motor pathways. It is achieved through reciprocal inhibitory input from interneurons to sets of motor neurons supplying antagonistic muscles. The same reciprocal innervation is also necessary for muscles that must act synergistically to carry out complex movements requiring contraction of more than one muscle. In this case, the reciprocal innervation is excitatory. Two other groups of interneurons, one in the superior colliculus of the brain stem and another in an area called the frontal eye fields located within the frontal cortex, generate complex patterns of activity that are transmitted to gaze centers and to lower motor neurons of the oculomotor system. These areas initiate complex movements such as smooth pursuit and saccade activity (previously described in Chapter 51). These two types of movement are involved in the visual tracking of moving objects; both are involuntary reflexes. The saccade and smooth pursuit systems offer excellent examples of the hierar-chicalarrangement of motor systems, with successive layers of interneuron circuits each providing an increased level of complexity in the motor pattern generated. The lowest level provides the basic stereotypic range of movement (in this case, movement in the vertical or horizontal plane coordinated by the gaze centers) and higher levels provide more complex patterns (e.g., smooth pursuit movement). Voluntary control of eye muscles and of all other skeletal muscles of the body originates from the motor cortex, a superficial strip of frontal cortexjust anterior to the central sulcus. Just as the sensory cortex is arranged in an orderly fashion, with adjacent parts of the body represented by adjacent cortical regions, so are motor neurons in the motor cortex distributed in an orderly manner. These cells represent the upper motor neurons that provide the excitatory drive either directly to lower motor neurons or indirectly through interneuron circuits in order to elicit voluntary movement. In the case of the oculomotor system, motor commands from the motor cortex must involve the gaze centers because even volitional eye movement must be coordinated. Most individuals cannot move the eyes independently even with conscious effort. Muscles of facial expression are innervated by lower motor neurons within cell bodies located in the facial nucleus and in processes that project through the facial nerve (VII). Muscles of the jaw are innervated by neurons with cell bodies in the trigeminal motor nucleus. Muscles of the larynx and pharynx are innervated by motor nuclei of the glossopharyngeal (IX) and vagal (X) nerves. The trapezius and sternomastoid neck muscles are innervated by the accessory nucleus of cranial nerve XI. All of these muscles share a common attribute in that they are embryologically derived from the branchiomeric arches and are classified as branchiomeric muscles, as opposed to somatic muscles, which are derived from somites. Collections of brain stem interneurons act as motor pattern generators for these motor pathways, providing relatively simple repetitive reflexes, such as chewing, as well as highly complex, integrative movement patterns for protective reflexes, such as the gag, cough, sneeze, and blink reflexes. Somatic muscles of the tongue are innervated by lower motor neurons in the hypoglossal (cranial nerve XII) nucleus, and they are involved in protective reflexes of the head region. Cranial nerves IX, X, and XT also participate collectively in the production of speech. Speech is initiated by upper motor neurons located in the inferior gyrus of the frontal lobe, including Brodmann's areas 44 and 45, collectively called Broca's area. Studies of neuronal circuits in song birds have provided insights into what may be comparable circuits for speech in humans. Here, again, the hierarchical principle pertains, with pattern generators present at brain stem levels responsible for composing motor command patterns that produce basic sounds, and neurons in higher cortical regions providing the same for more complex words and sentences. FIGURE 1 Functional distribution of spinal cord motor neurons. Cross-section of a lumbar spinal cord segment. Note that sensory information enters dorsally, whereas motor information exits ventrally. The Rexed laminae, indicated in Roman numerals on the left, are divisions of the spinal gray matter that are based on differences in the histological appearances of the 10 areas. The motor neurons in the ventral horn occur in groups arranged according to their target muscle, as shown on the right. Neurons innervating flexors are more dorsal; those for extensors are ventral; those for distal muscles are lateral (Rexed lamina IV), and those for proximal muscles are medial (Rexed lamina VIII). cell bodies and relatively simple circuits make them amenable to experimental analysis, and much is known about their functional properties. Axons of alpha motor neurons project through the ventral root of spinal nerves and innervate individual muscle fibers in the trunk (axial muscles), arms and legs (proximal muscles), and hands, feet, and digits (distal muscles). The number of individual muscle fibers innervated by a single neuron varies among muscle groups. Axial muscles, which serve primarily to maintain posture, have relatively sparse innervation, with one alpha motor neuron innervating up to 1000 muscle fibers. Proximal muscles require more innervation to activate the patterns of movement for locomotion. Distal muscles are the most heavily innervated, with a single neuron innervating as few as three or four muscle fibers and affording fine, controlled movements of hands and fingers. Alpha motor neurons are arranged in functional groups within the ventral horn of the spinal cord. Neurons innervating flexor muscles are grouped in the dorsal region of the horn; those innervating extensor muscles are found in the ventral region. Neurons innervating axial muscles are located medially within the ventral horn, whereas proximal and distal muscles are innervated by motor neurons in more lateral regions. Thirty paired spinal nerves carry motor fibers to their peripheral targets. 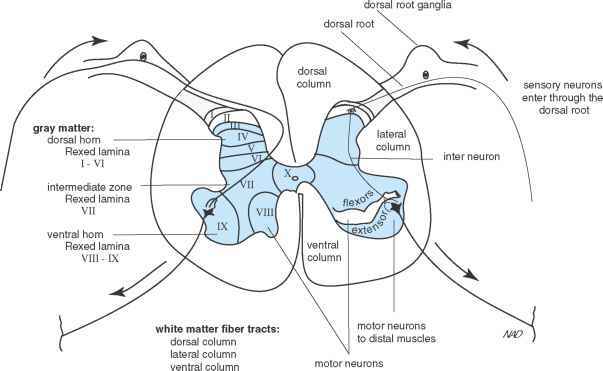 Motor fibers exit through the ventral root of the spinal nerve, and after a short projection they merge with the dorsal (sensory) root fibers that carry incoming touch, temperature, pain, and proprioception information from the body. Spinal nerves serve as landmarks to somatotopically separate the spinal cord into 8 cervical, 12 thoracic, 5 lumbar, and 5 sacral levels (see Fig. 1 in Chapter 50). Just as sensory information from the body is divided segmentally into dermatomes as it enters designated spinal levels, motor information exits segmentally, with each spinal nerve serving a designated region of the body called a myotome. Each myotome represents the segment of the body that receives motor innervation from an assigned spinal nerve. 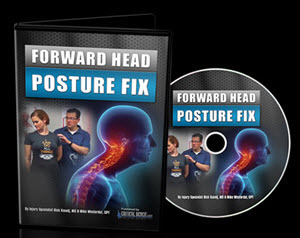 It should be remembered, however, that segmentation within the spinal cord is not absolute and that motor output as well as sensory input overlaps one or two segments above and below the designated nerve. to T1 for innervation of muscles of the upper extremities and a lumbar enlargement at levels LI to L8 for innervation of lower extremities (see Fig. 1 in Chapter 50). Each alpha motor neuron innervates a group of individual muscle fibers to form a motor unit (Fig. 2). The size of the motor unit depends on functional requirements. A. A motor unit: one motor neuron and all of its muscle fibers. The gastrocnemius muscle involves about 400 motor units averaging 750 muscle fibers each. The soleus muscle involves about 300 motor units averaging 180 muscle fibers each. FIGURE 2 Motor neuron pool. (A) A single motor unit consists of a motor neuron and all the muscle fibers it innervates; only four of the hundreds of muscle fibers are illustrated. No muscle fiber receives more than one neuron. (B) The 400 motor neurons of the motor neuron pool innervating the gastrocnemius muscle (shown in blue) are distributed in a column in the lateral part of the ventral horn of the lumbar spinal cord. This pool of neurons supplies approximately 300,000 muscle fibers. The motor neuron pool to the synergistic, soleus muscle is distributed in a column in the adjacent area of the cord (shown in gray). 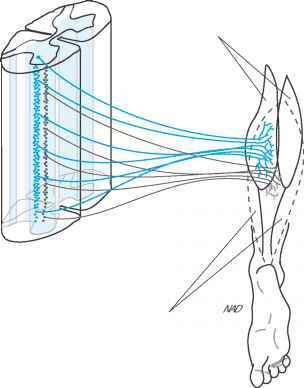 Antigravity muscles of the leg are composed of large motor units (1000 muscle fibers per neuron); muscles in the fingers which require much finer control are composed of small motor units (two or three fibers per neuron). In most cases, one action potential from an alpha motor neuron will cause a large excitatory postsynaptic potential in the muscle fibers it innervates and a muscle fiber action potential will be generated. In response, the muscle fiber will contract and then relax. To evoke a sustained contraction rather than just a twitch, there must be a barrage of action potentials from the nerve. If the action potentials occur at sufficient frequency, there can be a summation effect, because of the buildup of intracellular calcium within the muscle, so that the degree of contraction (i.e., muscle tension), as well as the duration of the fiber contraction, is increased. To contract an entire muscle, appropriate motor neurons act synergistically as a unit or motor neuron pool to activate a critical number of individual fibers within the muscle. Increasing the number of activated motor units will lead to a stronger muscle contraction. In response to increased firing from the neuron pool, the muscle will shorten and cause movement of the limb or digit. Under isometric conditions where the muscle cannot shorten, contraction will lead to increased tension on the muscle. The responsiveness of a motor neuron is largely influenced by its size. Small neurons (small cell body, small axonal spread, small number of innervated muscle fibers) are the easiest to excite and are therefore the first within the neuron pool to be triggered by appropriate input, and the muscle fibers they innervate will be among the first to be activated. As more excitatory input arrives, larger neurons reach threshold and other fibers are recruited into action. This "size principle'' is an important mechanism for providing the finest control under the lightest load. Additional variations in muscle function are related to inherent properties of individual muscle cells. Fast-twitch muscle fibers rely primarily on glycolysis to provide adenosine triphosphate for metabolic needs. They characteristically fire at high frequency (30 to 60 Hz), and they fatigue relatively quickly. Slow-twitch muscles use oxidative phosphorylation and rely on glucose supplied from the circulation to provide adenosine triphosphate. This is reflected in the large number of mitochondria and large amount of myoglobin present, making the tissue appear redder than fast-twitch muscles, which appear relatively white. Slow-twitch fibers are slow to fatigue and fire at lower frequency (10 to 20 Hz). Fast-twitch and slow-twitch fibers are matched with motor neurons that fire at characteristically fast and slow frequencies, respectively. Interestingly, neuronal phenotype (fast or slow) can influence muscle phenotype. Experimentally switching the normal slow-twitch motor neuron innervation of a slow-twitch muscle so that it innervates a fast-twitch muscle will cause the muscle to assume a slow-twitch phenotype. Further evidence for neuronal control over muscle metabolism is seen in the atrophy that occurs in muscles that lose innervation. Donoghue J, Sanes J. Motor areas of the cerebral cortex. Livingstone, 1997. Henneman E, Somjen G, Carpenter D. Functional significance of cell size in spinal motoneurons. Neurophysiology 1965; 28:560-580. What motor nuerons control muscles of the head?